Did you also get the message that “It’s okay for your baby to cry”, that it’s “normal”? That “you shouldn’t hold him” when he cries, because “he’s getting his way”? Did you try (almost) 36,000 methods to “let her fall asleep alone”, because that’s the way “she’ll learn”? Maybe all of that sounds wrong to you. Maybe you did your best to believe and apply these “tips”, but they don’t work at all. Maybe your gut tells you no, it does not apply to your baby, all of that. You feel he’s crying for a reason. That he has something to tell you. That it’s okay that you go and hold him every time, and for good. I believe, and several other experts agree, that the parental approach of avoidance or progressive waiting before picking a baby up don’t work for several reasons. And that, dear great mama, you’re right. A crying baby is talking to us. A crying baby doesn’t feel right. A crying baby needs his trusted people. You sensed it, your little baby, he has no words to him yet. He still has trouble moving to get what he wants. He has no perception of time, nor awareness that when you are not there, you still exist – a second without you may seem like an eternity, all alone (and scared). All he has is his voice. If we observe him when we leave him alone, first we may see him babbling. Then, his soft sounds can become insistent, as if he means, Hey, I’m there mom, I need you here! Often if you answer back to him, you hold him, or give him what you feel he needs, as with a sixth sense, his smile and his babble resume. Otherwise, the escalation of sounds resumes. And there you go! He’s crying. He’s even screaming to the top of his lungs, maybe. With all his being, he tells us something. And we should ignore it, that’s the common sense today? Perhaps, and surely that at the end of his strength, he will end up quiet. And we could reason that You see, I told you, he was crying for nothing. That’s what it’s like, a baby. But it has been discovered that under this silence hides discontent and fear. Perhaps even more, his deep anguish and new conviction that No matter what I do, I will not have what I need. Nobody is there for me when I need it. Perhaps he will carry with him this heavy silence all of his life, deprived of a healthy contact with his own. It has been discovered that under this cover, he is under stress and his stress hormone levels are sky high. It was measured by cortisol levels in saliva. This stress could affect his central nervous system, his emotional capacity, and his behavior as he grows up. And this silence, according to Dr. Karl Heinrich Brisch, head at the Munich Children’s Hospital, would be similar to the thanatosis reflex in animals whose lives are in danger and simulate death. 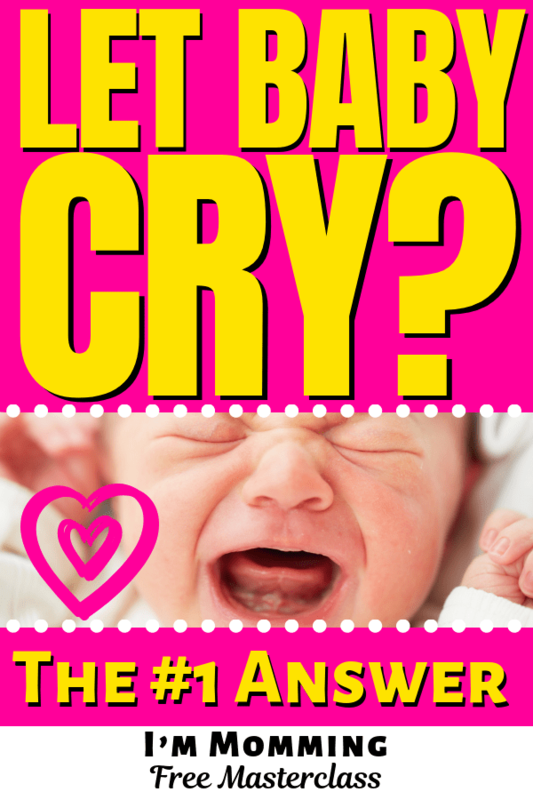 We have (finally) discovered that the normal state of a baby is not crying. A cry is actually what it looks like: a warning signal. So yes, mama, if you needed reassurance from a reliable source or permission to pick him up whenever he cries, I give it to you. You can listen to your inner voice. You can listen to your baby’s voice. Try to understand what he’s saying to you, I have no doubt that you’re the expert on the subject. He will surely thank you in no time with his amazing smile and his little coos. Maybe one day, when he has reached his full potential through your many caring efforts, he will openly thank you for listening to him as a child, and will keep you as one of the most important people in his world. This is my best wish for you both.